Endurance activities, such as walking, rowing, bicycling indoors and out, dancing, raking leaves, lawn mowing, rearranging furniture, hiking and cross-country skiing will go a long way in increasing your cardiovascular strength. If you have arthritis, exercising in water will be less stressful on your joints, according to the Arthritis Foundation. The water’s buoyancy supports your body’s weight, not your joints. Start swimming, do water aerobics or walk in the water. As with all physical exercise, when starting a new fitness routine, you should begin slowly and gradually increase what you do in both duration and intensity. Activities that build muscles will make it easier for you to walk up and down stairs, get in and out of a car, lift and carry groceries, plus get in and out of a chair more comfortably. These activities include lifting weights or using resistance devices such as bands or the water. According to the Arthritis Foundation, exercising in water will provide you with 12 times the resistance as land-based exercises. 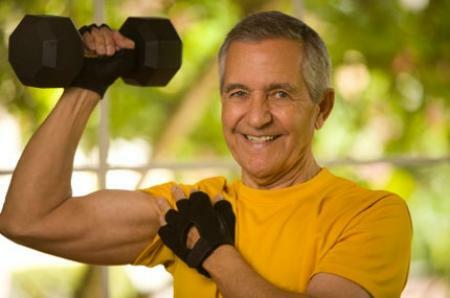 -Perform strength-building exercises for 30 minutes at least twice weekly, suggests the National Institute on Aging. The 30 minutes can be divided into 10-minute increments throughout the day. Breathe in as you begin these exercises and breathe out as you push or lift. Be sure to use steady, smooth movements while doing these exercises. -Build your wrists by doing wrist curls. Sit upright in a firm chair. Place a one or two-pound weight in your hand, palm up. Rest your forearm on your chair’s arm so your hand is over the edge. Slowly bend your wrist up towards the ceiling. Hold for five seconds. Slowly lower your wrist to the original position. -Relax for five seconds. Repeat this strengthening exercise 10 times with each hand. If holding a weight is too much to begin with, do the exercise without a weight. Stretching, or flexibility, exercises need to be included in everyone’s fitness activities. That goes for seniors as well. 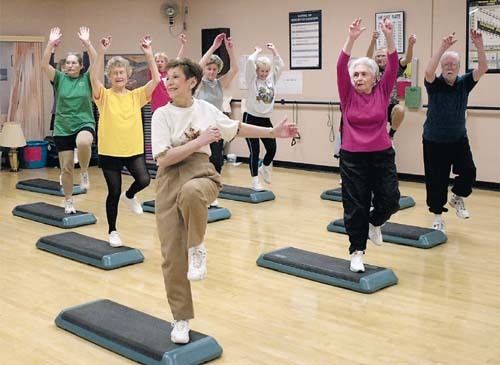 The Arthritis Foundation recommends starting your exercise program with stretching or a range of motion exercises. Try doing yoga to stretch your muscles. These exercises warm up your muscles and improve your mobility. In fact, these exercises will help decrease your joint stiffness and pain, states the Arthritis Foundation. -Do stretching exercises three to five times per session, according to the National Institute on Aging. -Do a forward bend. Slowly bend your upper body forward while stretching into position. -Hold your stretch for 10 seconds. Relax for five seconds. Return to the upright position. -Relax for five seconds. Repeat the stretch while trying to stretch farther. Exercising on a regular basis can decrease the risk of developing many illnesses, such as heart disease.